I've managed to find another chair! This one belonged to Rousseau and is on show at the Abbaye de Chaalis, where a smart new "Espace Rousseau" was opened in 2012 to mark the Rousseau tercentenary. It is described as an armchair ("fauteuil"), though the word suggests something rather more comfortable and upholstered. 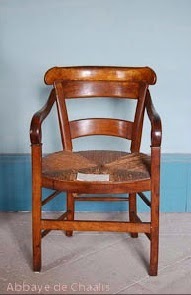 It is said to be the chair in which Rousseau died. 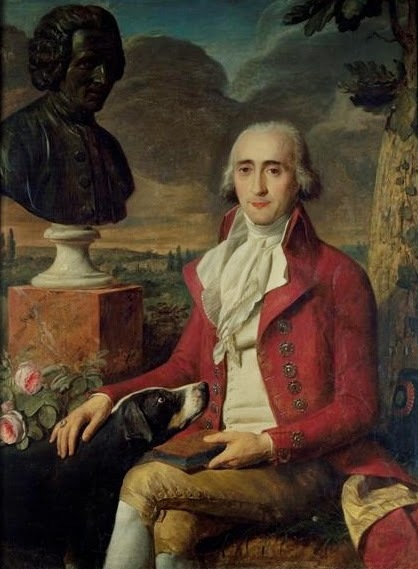 The chair - along with various other bits of personal paraphernalia, notably Rousseau's inkwell, collar and walking stick - belonged to the collection of the marquis Louis-René de Girardin, In May 1778 Girardin and his wife had offered the philosopher a home at nearby Ermenonville where they had created "natural" gardens inspired by his writing. Sadly Rousseau did not live long to enjoy his sanctuary. 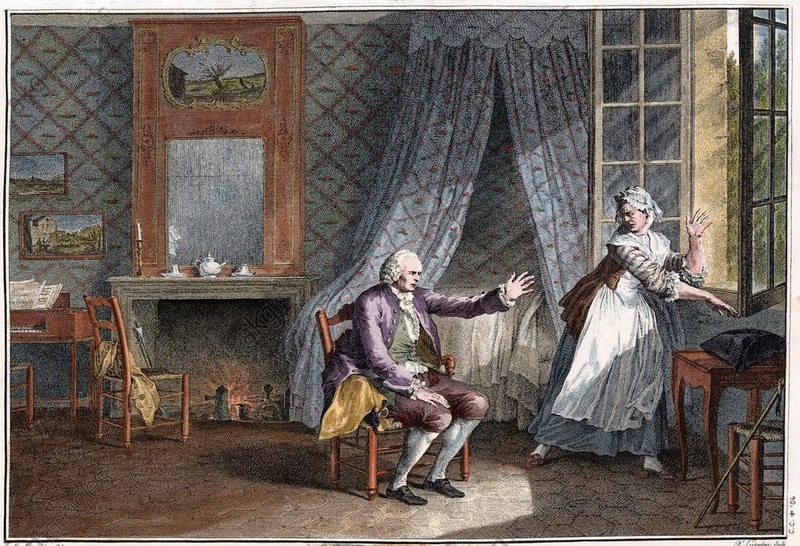 On 2nd July 1778, having returned from his habitual morning walk, he was enjoying coffee in the company of Thérèse Lavasseur when he suddenly complained of tingling on the soles of his feet, a sensation like cold water running down his spine and pains in his chest. He was then seized with a violent headache. He was put to bed but subsequently attempted to get up, fell to the floor unconscious and never recovered. Rumour spread that Rousseau had taken poison or shot himself, but the autopsy revealed massive cerebral bleeding as a result of a stroke or, as modern opinion tends to believe, the repeated falls that he had previously suffered. "The Last words of J.J. Rousseau" engraving by Heinrich Guttenberg after Jean Michel Moreau (1741–1814) . "La Collection Jean-Jacques Rousseau" (virtual visit) Chaalis Rousseau tricentenary minisite.